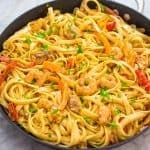 This delicious Cajun Chicken and Shrimp Pasta makes an easy, quick and filling dinner for the whole family. 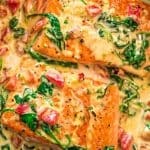 The smoky Cajun spice and the creamy Parmesan sauce create an unforgettable combination! 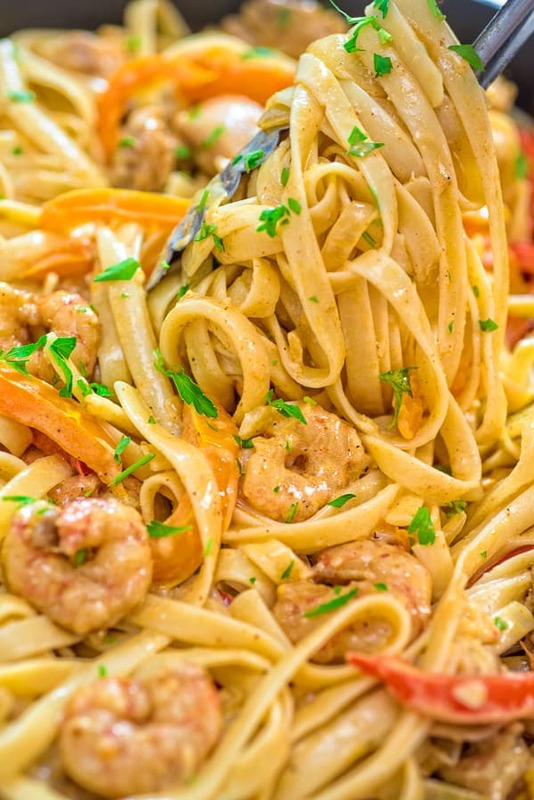 I love everything about this Chicken and Shrimp Pasta! Every time I serve it, I feel like a fancy Italian chef because this dish is so elegant and tasty. 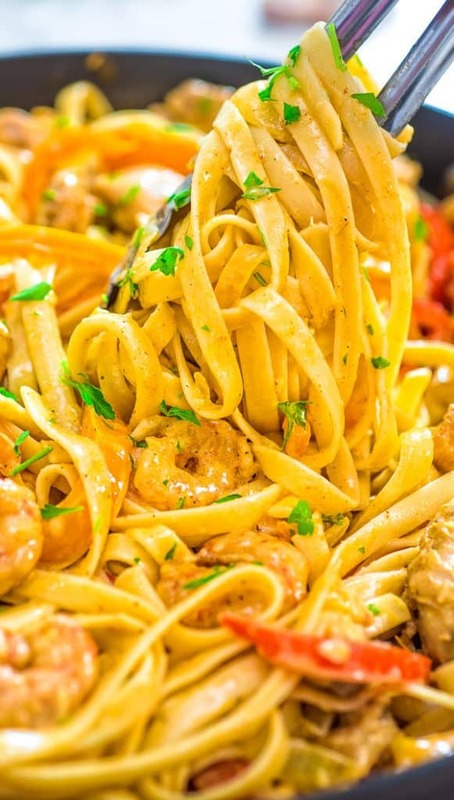 Tender chicken and shrimp are cooked in Cajun seasoning before they are combined with seared bell peppers, onions, creamy Parmesan sauce, and fettuccine. Oh, yes! 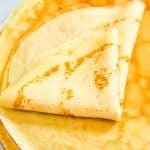 I know you want it, too. 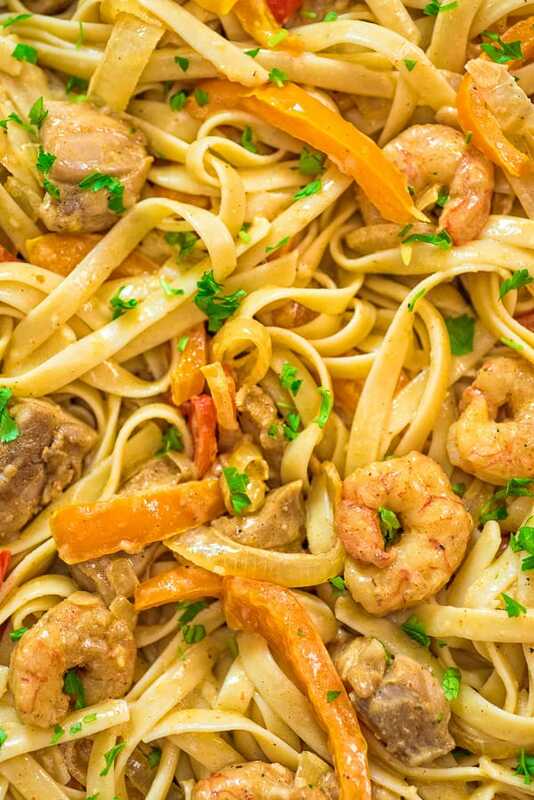 This Chicken and Shrimp Pasta works with pretty much any pasta variety. 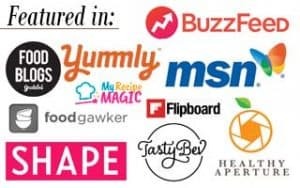 Use your favorite kind! 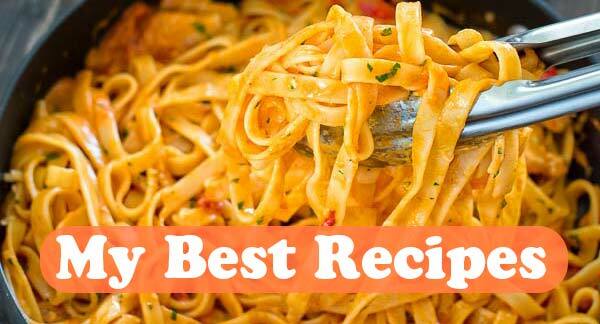 Fettuccine, spaghetti, and penne are among my favorites. 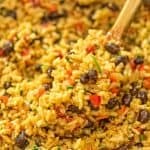 You can also use whole grain pasta here. I always recommend choosing wild-caught when it comes to selecting shrimp. You’ll need large, peeled, and deveined shrimp. Dark chicken meat is far more tender and succulent than chicken breasts, so I suggest buying skinless chicken thighs. 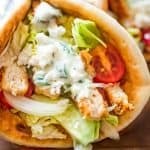 However, you can use chicken breasts if you prefer. 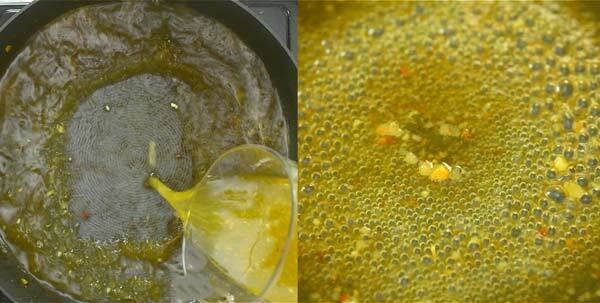 1.Add the pasta to a pot of boiling water with 1 tbsp. of salt, and cook according to the package instructions, until al-dente. Drain, rinse, and set aside. 2. While the pasta is cooking, place a large, non-stick skillet over medium-high heat. Add the olive oil, chicken, shrimp, and Cajun seasoning. Cook, stirring occasionally, for about 10 minutes, until the chicken and shrimp are just tender and cooked through. 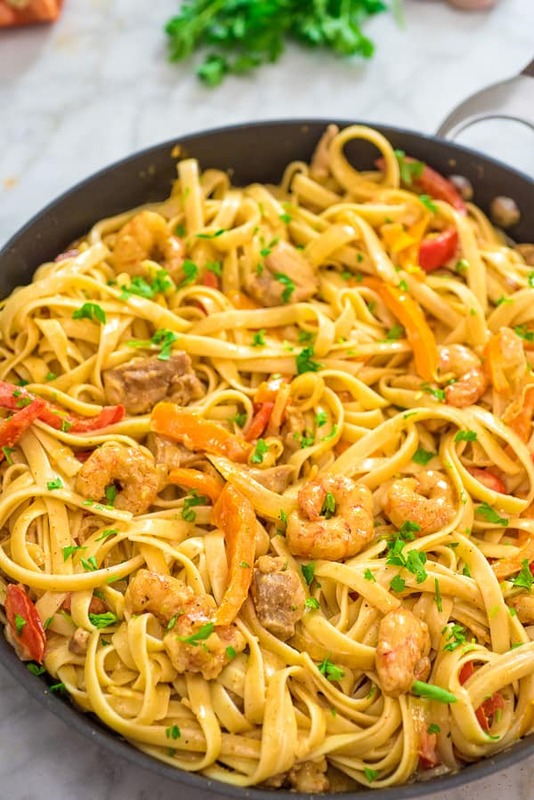 Remove the chicken and shrimp from the skillet. 3. 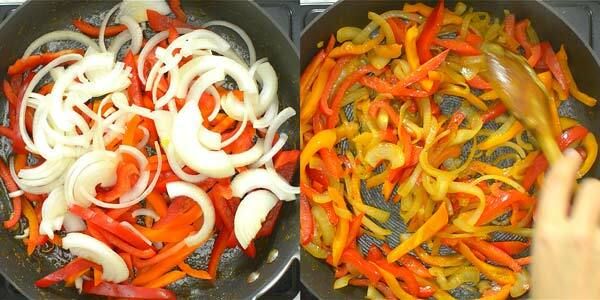 To the same skillet, add the bell peppers and onions. 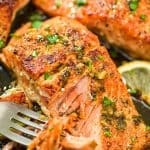 Cook for about 5 minutes, and remove the vegetables from the skillet. 4. Add the wine and chicken broth and boil down until there is only 25% of the liquid left. 5. 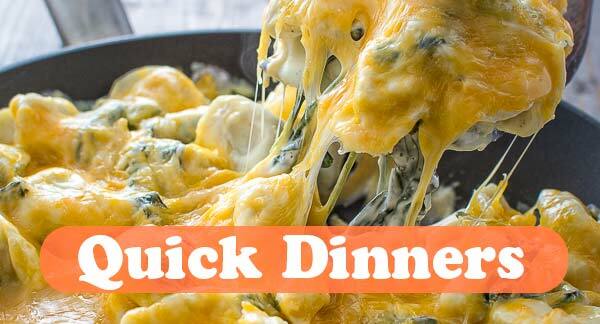 Stir in the Half & Half, garlic, and Parmesan cheese and stir until just creamy and smooth. Let it come to a simmer without boiling. 6. 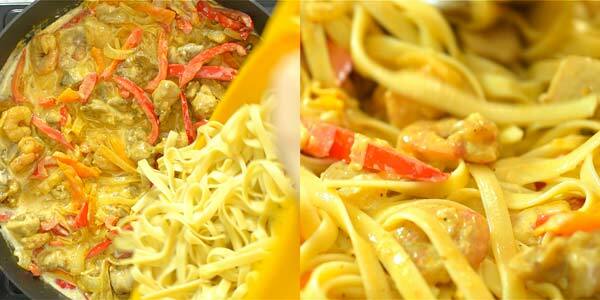 Stir in the vegetables, chicken, shrimp, and drained pasta, tossing until noodles are well coated in sauce. 7. Garnish with chopped parsley, if desired. DON’T WANT TO USE WINE? No problems! Just use chicken broth instead. A bowl of fresh salad will pair well on the side. I also love to have a plate of Roasted Vegetables or this Zucchini Salad . Yes! Just add a splash of water and reheat slowly over low heat until very warm/hot, but not simmering. Add the pasta to a pot of boiling water with 1 tbsp. of salt, and cook according to the package instructions, until al-dente. Drain, rinse, and set aside. 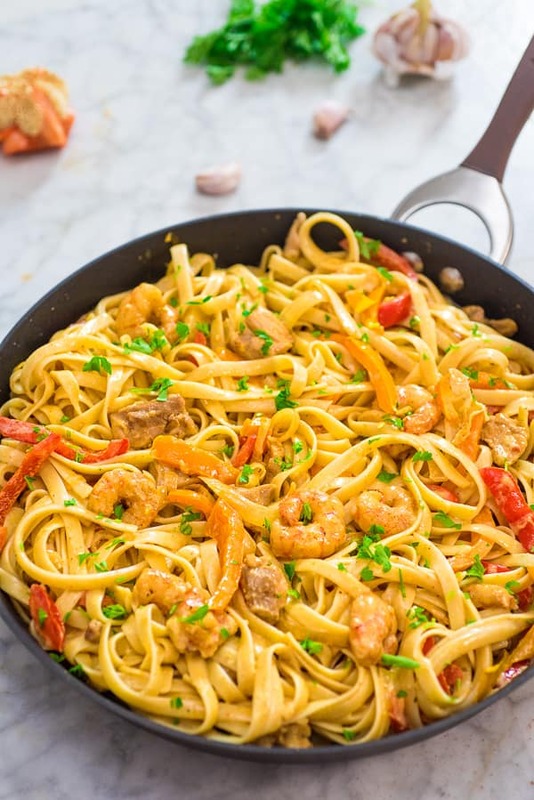 While the pasta is cooking, place a large, non-stick skillet over medium-high heat. Add the olive oil, chicken, shrimp, and Cajun seasoning. Cook, stirring occasionally, for about 10 minutes, until the chicken and shrimp are just tender and cooked through. 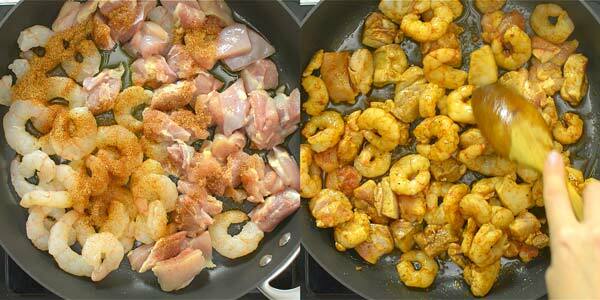 Remove the chicken and shrimp from the skillet. To the same skillet, add the bell peppers and onions. 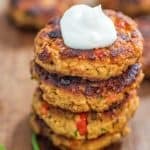 Cook for about 5 minutes, and remove the vegetables from the skillet. Add the wine and chicken broth and boil down until there is only 25% of the liquid left. 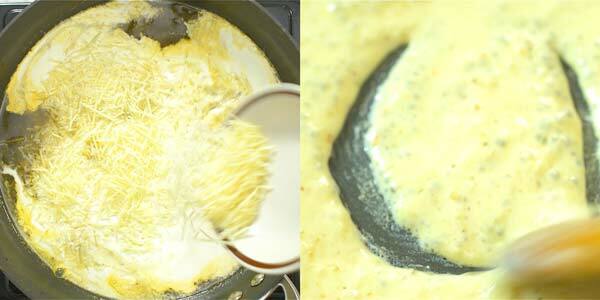 Stir in the Half & Half, garlic, and Parmesan cheese and stir until just creamy and smooth. Let it come to a simmer without boiling. 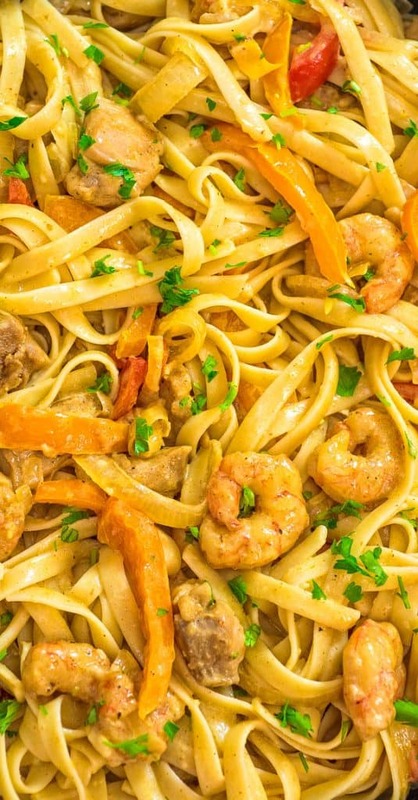 Stir in the vegetables, chicken, shrimp, and drained pasta, tossing until noodles are well coated in sauce.